is accompanied with a discussion about breakfast and veganism. I’ve been dubbed as a morning person, but since I was in university, I used to stay up until 2 or 3 almost every day when I worked and volunteered at my university’s walk home service. Much to Chris’s chagrin, as soon as I wake up, I become a ball of energy that’s ready to take on the day. Poor ol’ Christopher just wants to sleep in, but 10/11 am is as late as I can sleep. Any later and I feel off-kilter. Despite my morning-person affinities, I don’t actually eat breakfast much. It’s weird because I actually love breakfast. Before my vegan days, I had a breakfast special any chance I could. Two eggs, bacon, rye toast, and some water. Sometimes at 2 am on a Friday night with my floormates from residence, sometimes on Sunday at 10 am like normal humans. And when I had the opportunity to have eggs benedict, that was my JAM. Poached eggs smothered in hollandaise sauce, AKA more eggs, with homefries on the side was a staple. I’ve had people misinterpret my lifestyle choice for a preference. The argument for “you chose not to eat meat, why would you eat stuff that mimics it?” is countered with the fact that just because I choose to be vegan doesn’t mean I don’t find a chicken burger or scrambled eggs to be delicious. Those things taste delicious, but I don’t want to support the unwilling deaths to enjoy those foods. I eat vegan because I want to live a more compassionate life and avoid causing direct harm to any animals through my diet and lifestyle. That includes the the dairy cows that are pumped with hormones to lactate, chickens cooped up in tiny spaces to lay eggs, pigs slaughtered to make bacon, sheep killed and skinned to adorn UGGs, bird plucked to fill pillows, or rabbits skinned to adorn the hood of a winter jacket. I don’t want any part of it if I can help it. But that’s my choice. If anyone is curious, Chris is not vegan or vegetarian. He very much loves eating chicken and roast beef. I don’t pressure him to eat vegan, but since I’m the main cook anyway, anything we eat is going to be vegan unless he wants to add cheese or cook his own meat (usually he just adds cheese but never he really feels compelled to cook any meat). We’ve had our tribulations about how we’re going to co-exist with different diets, but I think we’ve got it figured out. Eating vegan is a choice. I will always encourage people to eat more plant-based, but ultimately, I don’t have a say. All I can say is that we as beings that can communicate and cognitively understand pain in others, it is up to us to stand up for those who don’t have a voice or can communicate their pain and suffering. So to reign myself back in here, as much as I love eggs for breakfast, I choose not to eat them anymore. But sometimes in the morning, I really want traditional breakfast food with that sort of stinky, egg flavour that eggs have. I recently discovered black salt aka Kala Namak, which is an Indian spice that has an eggy flavour thanks to its sulfur content. While this isn’t really a perfect omelette, it sort of looks and tastes like one. It’s full of protein, like an omelette would be, but has more of a pancakey-bread texture than omelette. It tastes delicious though, and you can easily add your own add-ins! Want a vegan Western omelette? Add some peppers and onion. Going more for a florentine omelette? Add some tomato in with the spinach. Caramelized onion and mushrooms would be fantastic as well, but it’s all up to you. In a large mixing bowl, whisk together flax meal and water and let stand until thickened. Add chickpea flour, nutritional yeast, cumin, garlic powder, red pepper flakes, black salt, black pepper. Whisk in water 1/3 cup at a time until all water is incorporated and no lumps remain. Stir in the chopped spinach, then set aside to thicken. It should have the consistency of pancake batter. Preheat a medium-sized non-stick pan over just-below medium heat. Add olive oil before you add the batter, and swirl around the pan to coat. Pour in the batter and cover to let the batter cook for about 10 minutes. Once the middle of the batter looks matte and more breadlike, flip to cook the other side. The first cooked side should have nice, browned patches that are crispy. Cook the other side until golden. Transfer onto a plate and serve! =O NO BREAKFAST AT ALL!? In writing this is going to sound crabby but it is not intended to be....Does waking up at 10-11am make you a morning person? :) That's a funny one Lisa! This looks so delicious. I must find my chickpea flour and make this. I used it last to make "fronch toast" from Vegan with a Vengeance.I totally understand where you are coming from with regard to those who think vegans/vegetarians shouldn't eat anything resembling meat/fish etc. I gave up meat for ethical reasons, not because I didn't enjoy the taste. Some non-vegetarians don't seem to get that point. I miss meat/seafood all the time but for me there is no going back.BTW, black salt is phenomenal sprinkled on avocado. Sooooo yummy. Thanks so much. Really looking forward to making this. hi! love ur blog! i tried this recipe and it was yummy but it didnt turn out yellow like yours. it was brown/purple-ish color. do you have any idea why?? Oh! That's so so weird. 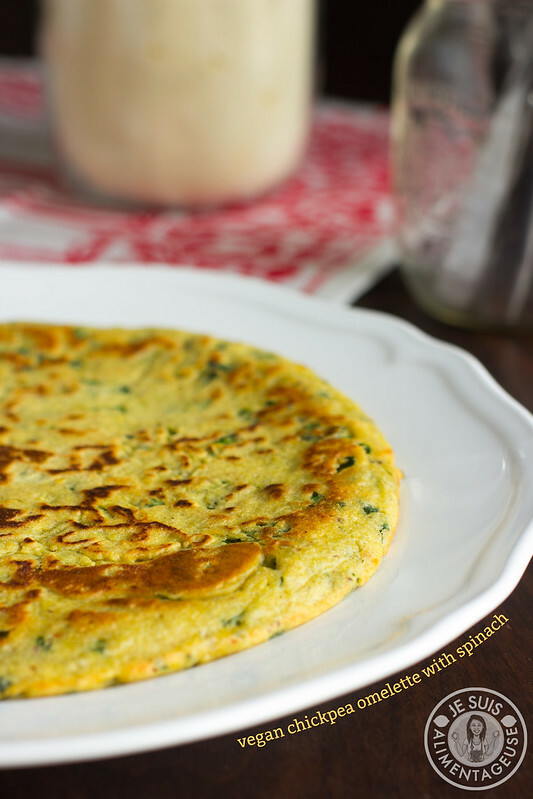 If you added any extra tamari, that would change the colour, as well as the colour of the chickpea flour to begin with. Nutritional yeast will also make it yellow-ish too. 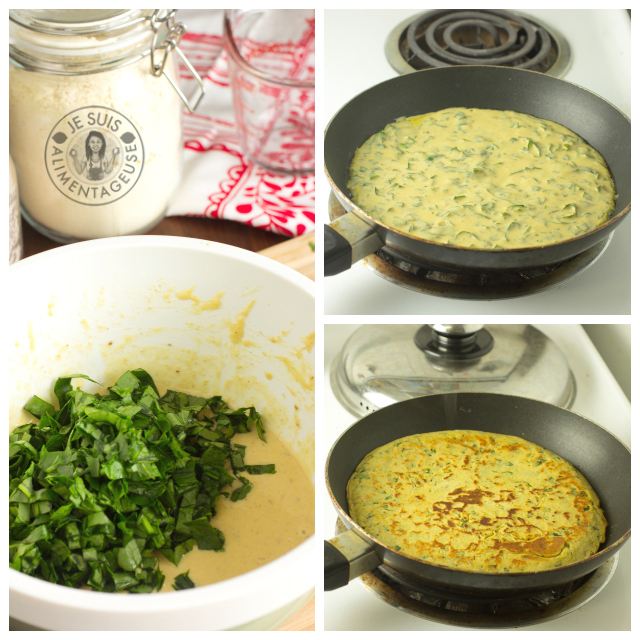 This is my MOST FAVORITE chickpea omelet recipe. Just one question... This makes a REALLY BIG omelet and alas, I'm the only one in the house who will eat it. So, I started making a few smaller ones (they're really filling! ), but they taste best fresh. So, could I make one and then store the batter to make more another day? If so, how long do you think I could store the batter in the fridge? Thanks! PS Didn't get black salt yet (made it with regular salt), but after reading the comments, I'll put it on my shopping list! Hi Deb! You're totally right, they're so much better freshly made. I don't think the batter would store well. 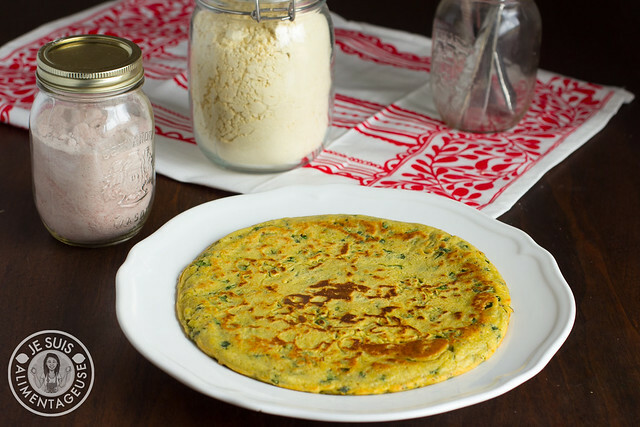 The chickpea flour is quite absorbent, and it might be a congealed mess in the fridge. I would recommend halfing the recipe, or even combining the dry ingredients to make a stand-alone mix so all you need to do is scoop out some and add the wet ingredients later (water and flax egg). Thank you for restoring my faith in chickpea omelettes! The flax egg addition and black salt made it perfectly eggy. gotta try it. Looks delish. You can probably fry some leeks and then throw the batter in. That would be so yummy too.